Jason M. Marrazzo, DDS, is a full-time oral and maxillofacial surgeon at MedStar Washington Hospital Center and the Children’s National Medical Center. Dr. Marrazzo treats patients for an array of complex conditions of the mouth, face, and jaws. Procedures that he performs range from major surgeries to minor surgeries. Major surgeries performed by Dr. Marrazzo include corrective jaw surgery (orthognathic surgery), complex facial trauma reconstruction, and the treatment of benign pathologies of the mouth, face, and jaws. Minor oral surgical procedures include wisdom tooth extractions, dental implants, and bone grafting. 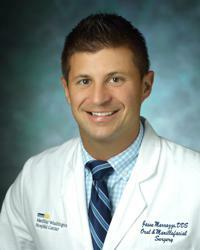 Dr. Marrazzo is known among his peers for his unique critical thinking ability, which he utilizes during diagnosis and treatment. He carefully plans and develops an individualized treatment plan for each one of his patients. This same attention to detail is carried through to the actual surgical procedure, during which he is extremely meticulous and strives to provide his patients with the best possible outcome. At the frontier of oral and maxillofacial surgery, Dr. Marrazzo is among early adopters of virtual surgical planning and guided surgery treatment modalities at Washington Hospital Center. This technology allows him to plan, visualize, and virtually execute a procedure on the computer prior to the actual surgery. Virtual surgical planning leads to more accurate surgeries, minimized complications, and improved overall outcomes. Dr. Marrazzo utilizes this techology, in conjunction with his surgical skills, to better serve his patients and reestablish facial form and function at both the Washington Hospital Center and Children’s National Medical Center, as part of the craniofacial team. Dr. Marrazzo also has a particular interest in complex dental rehabilitation with bone grafting and dental implants. More specifically, he has a keen interest for, and experience with, replacing teeth in the aesthetic zone (involving the patient’s smile) as well as same-day full mouth dental implant surgery, which includes the delivery of a new set of teeth. In line with his dedication to utilize the latest techniques and technologies to improve his patients’ outcomes and accomplish their goals of treatment, Dr. Marrazzo uses human growth factors and bone substitutes for bone regeneration treatments. These products may one day completely eliminate the need to obtain bone graft from the patient themselves, thus decreasing the risks of the surgery and the recovery time post operatively. Dr. Marrazzo completed his dental training at the University of Maryland School of Dentistry, where he initially discovered his passion for oral and maxillofacial surgery. Following graduation, he joined MedStar Washington Hospital Center for a four-year intensive residency in oral and maxillofacial surgery. During his training, he was exposed to the full scope of oral and maxillofacial surgery and went on to serve as Chief Resident. Outside of the hospital, Dr. Marrazzo has a passion for international mission trips as well as local volunteer efforts. In his spare time, he has volunteered his time, knowledge, and expertise to helping serve underprivileged communities in the Philippines, Maryland, and Virginia. He also enjoys spending time with his friends and family, exploring the DC area, and experiencing new restaurants and cuisines.